The IRS has been encouraging all of us taxpayers to file our tax returns through the internet for some time now. On their official website, they mention several advantages of e-filing but arguably the most important one is the ability to do it for free! 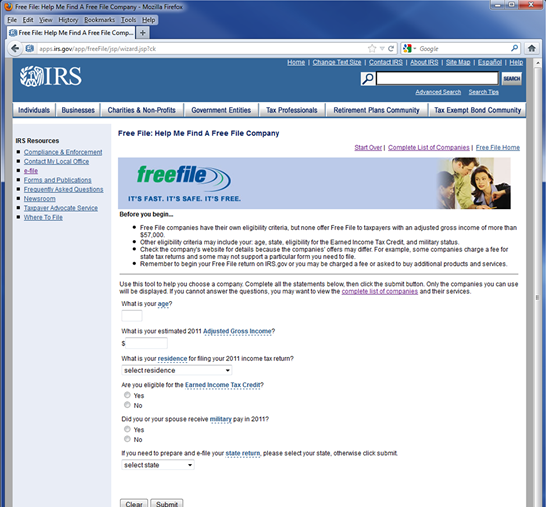 e-file for free if your total income is no more than $57,000. 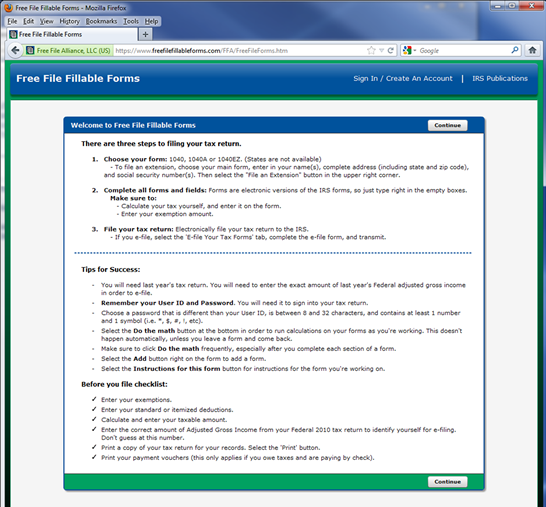 e-file for free using fillable forms (good only for federal tax return, cannot be used for state returns). e-file your returns you prepared with the help of commercial software you purchased. e-file your tax returns prepared for you by a tax professional. This section reminds you about the documents you need to precede filing your taxes and helps you find the right software to do it. It is important to know that free federal tax filing is available to taxpayers who earned less than $57,000 in the previous fiscal year. Also, once you determine which software to use to file your taxes (see below), you will be taken to that company’s website and use their services. 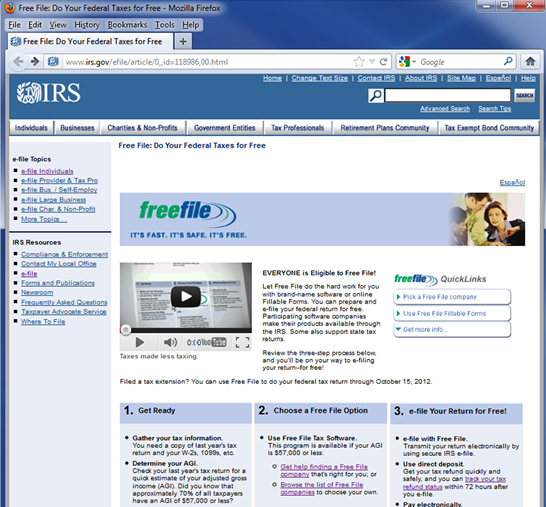 Note that filing taxes is not completely free as these features are without cost while filing federal taxes. In most cases, filing your state tax carries some cost that vary from one company to the other. You will have to check details on the company’s website. Some states (AK, FL, NV, NH, SD, TN, TX, WA, WY) do not require individuals to report income tax obtained from wages. If you obtained income from other sources, check the reporting requirements. When you select “Get help finding a free file company” you will be directed to the following page. Here you have to enter your age, estimate income, state of residence, whether or not you’re eligible for Earned Income Tax Credit, any military pay received, and state returns if required. 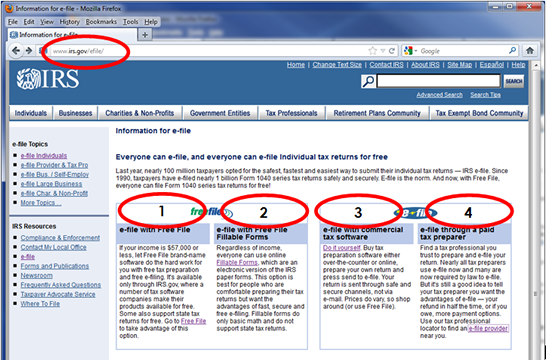 When you click “Submit,” you will have a list of companies you can use to proceed with filing the return. You can also click on the list of participating companies just to see what your options are. That list includes popular programs like H&R Block Free File, TurboTax Freedom Edition, and eSmartTax by Liberty Tax Service. This is an alternative to file paper forms if you prepare tax returns by yourself. The forms available include: 1040A, 1040, and 1040 EZ and you can use this method to file an extension. You will have to make all the calculations, deductions, and exemptions by yourself. Once you’re finished, click on “E-file your tax forms”. This option does not allow for filing your state taxes. If you’re using this method for the first time, you will have to create an account. For the returning users, just sign in and provide your password. If you need some help calculating your tax liability, purchasing designated software might be a viable option. Those programs walk you through each step of tax filing process, help you calculate all the obligations and point out deductions based on your filing status and sources of your income and expenses. They allow you to file electronically, allowing for faster processing of your returns and electronic payment for any amount owed or an expected refund. This is a very handy option that finds local tax professionals based on your zip code. If you file tax returns for the first time or just moved to the area, this is a nice resource. These individuals prepare your returns and then file them electronically for you.